“Australians don’t read,” author Max Barry quips. 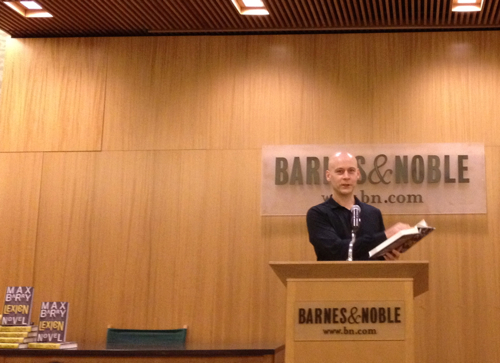 Barry took to the podium at the Barnes and Noble on 86th and Lexington to read from his new novel, Lexicon, available yesterday. He is also promoting his new film, Syrup, based on his debut novel of the same name. Lexicon, his fifth novel, examines the idea of privacy. His impeccable timing aside, his previous novels have all been masterful satires of modernity. 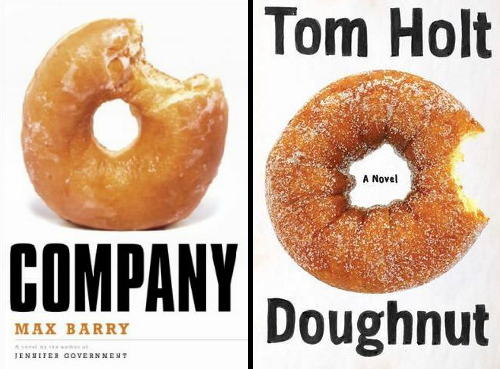 In Syrup, he deconstructs the marketing world; Jennifer Government criticizes the corporatization of government while Company looks at the futility of corporate culture. Machine Man, which began as a page-a-day project on the internet, looks at the all consuming nature of technology. The hallmark of his work is a precision in comedic timing combined with cutting contemporary commentary. Barry, an Australian, was only partly joking about Australians not reading; promoting books in Australia never involves touring around the country reading excerpts. The concept is entirely unheard of. When his first novel was published, he came to New York to promote it. One of his first readings ever was at the now shuttered Astor Place Barnes and Noble. He joked that the only reason people in the store wandered into the reading was to find the source of his bewildering Australian accent. Since authors actually write rather than read, Barry decided to turn the act of writing into performance art. Instead of reading, he would write for an audience. He (and other authors), were set up with a projector screen. He took suggestions from the audience and began working on a story. The audience could watch his creative process in real time. The whole thing was a disaster, “the worst thing I’ve ever done,” and it made him feel as though he had been “punched in the brain.” The original intent–writing a short story in three hours under the watchful eye of an audience–ended with only a few hundred words and left him unable to write for days. While traveling to New York, Barry explained that he had been reading a novel (Gone Girl) while on the airplane. He found the novel so compelling that the plane taxied out to the runway, took off, and he was halfway to New York before he realized he was even off the ground. A compelling narrative, he explains, is always his goal. Barry then read from Lexicon before taking questions from the audience. The poet Lee Bob Black, who coincidentally, is also a character in Lexicon, asked the first question of the evening: would Barry ever take up serials? The answer was a mix: yes, but not right now. Barry explained that he enjoys creating new worlds every time he starts a book and a serial would ultimately ruin that aspect of writing. As often is the case, the questions turned to the issue of social media. Barry explains he rather be left alone to write books. When his novel Machine Man was released, his publisher requested that he produce a book trailer. If you’re confused as to what a book trailer is, so was Barry, a question he raised in the video he ultimately produced. The one component of social media he enjoys though is the instant feedback he receives from readers. Released for only a day, and he has already heard back from fans regarding Lexicon. The positive encouragement is the best part about modern social media’s reach. At one point, Barry catches a glimpse of a book cover on the shelf of the store and stops– he thinks he sees the cover of his novel, Company. Its not. “There’s a lawsuit,” he jokes. He of course was also promoting the new movie Syrup. The film is based on his first novel. He originally sold the film writes to a producer, though that film was never shot. When the option expired, Barry took up screenwriting and wrote the screenplay version of his novel expecting little would ever come of it. He seemed to regret entering the screenwriting world, in part, he explains because films are often never completed. A novel only requires a writer; even if its never published, the novel is a completed work of art. But a screenplay is only a piece of a broader puzzle requiring all sorts of other participants to finish it. A movie of the fourteen year old novel had been promised for so long, he didn’t believe Syrup would actually end up getting produced, not even when the director asked if he wanted to make a cameo. “It doesn’t get easier,” Barry explains when asked about getting his later novels published. He expected that once his first was published, selling the others would prove easier. That’s not the case, and partly why he ended up producing the successful online game, Nation States. The text based game was a promotion he devised for the novel Jennifer Government. He had realized that he had to help sell his books anyway he could. With 3.4 million players, Nation States is a success on its own and Barry wonders if maybe more people have heard of the game than the book it was built to promote. Despite having produced five novels, a number of screenplays, and Nation States, there are some manuscripts that Barry wrote that may never end up published. An audience member asks about these by name, including one titled The Exceptionals — “that’s why I don’t talk about those anymore,” Barry says.